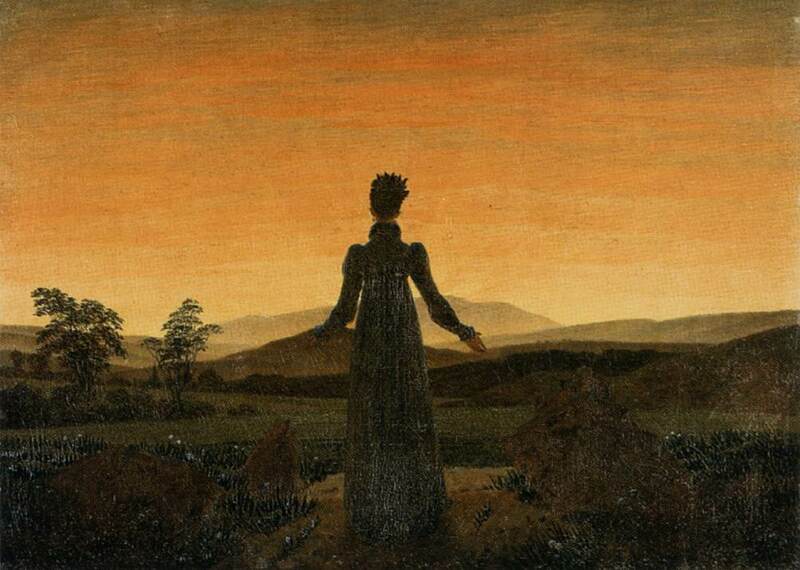 Woman Before the Rising Sun – Painted by Caspar David Friedrich in 1819. Recently, I have been enjoying the paintings of Caspar David Friedrich, a 19th Century German artist. I had been familiar with a single oil painting of his called The Sea of Ice since childhood, but last week, I became familiar with a large body of his work. Today is Winter Solstice, the shortest day of the year, but for the next half year, each day will become a little longer as the sun rises a little higher in the heavens. Being a lover of the sun, I highly praise the day. For this occasion, I like to rise early to praise the Goddess and be especially kind and helpful to others. Like the woman in the Friedrich painting above, the Goddess is looking out over her domain, and naturally, her palms are forward for nature is giving. Here is a verse from the Veda for Understanding the Sacred Way on Winter Solstice. The precious ego is the first to go for the light.